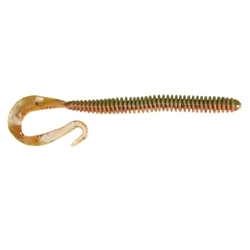 The Lake Fork Worm features a large diameter ringed body that releases air bubbles for a natural breathing action and, at the same time, conceals the hook. The large double curled tail sets up a vibration action as the lure is retrieved, or on the fall. The Garlic & Salt Impregnated Lake Fork Worm has the bulk to work it through the heaviest of cover and the flavor to make fish hold onto the lure longer for more hook sets.